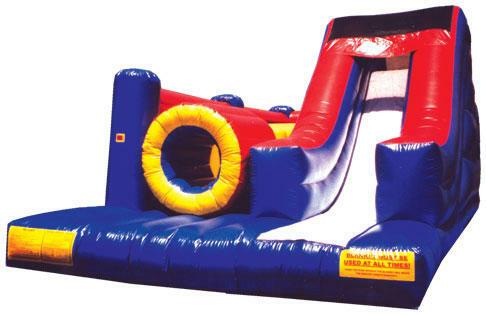 At Lotza party we offer many choices when it comes to obstacle course rental. We have obstacle course rentals for young children that offer smaller slides and even basketball hoops. For the larger kids Lotza Party has a couple of different options. Please browse our selection below and shop in confidence. Lotza Party is the areas largest mobile entertainment company. 70% of our business is from return customers. Give us a call and see why we are the peoples choice for safe, fun and enjoyable party entertainment. We look forward to building a relationship with your family for years to come. Thanks for visiting us at Lotza Party. See you at the party! 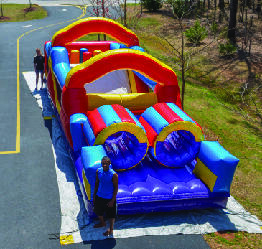 Lotza Party's Backyard Obstacle Challenge offers 40 feet of challenge obstacle entertainment in one unit. This inflatable play structure takes participants on a larger journey through tunnels, around horiztontal and vertical pop-ups, with plenty of climbing and descending along the way! This sleek, low-profile Backyard Obstacle Challenge provides a bright, purple, yellow and red primary-colored theme and its arching design will attract attendees and keep them entertained. This inflatable obstacle course can be an amazing centerpiece for any backyard party. 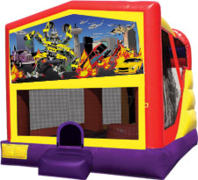 The inflatable play structure begins with a front-loading obstacle entrance, taking participants through tunnels and pop-ups to facilitate maneuvering skills and build confidence. The challenge obstacle then leads to an exciting front-exiting climb and slide, all to guarantee hours of enjoyable physical activity. Each inflatable play structure has mesh windows for easy viewing, and is constructed of the fire-resistant, lite n' strong™ vinyl for easy portability, durability and safety. The obstacle course challenge is a crowd favorite. It offers the obstacle challenges of the 40 foot obstacle course with the addition of a giant slide. Vertical and horizontal pop ups as well as crawl tubes make this course a challenge for both adults and kids alike. Our obstacle course challenge books very fast during the spring and summer for private parties as well as township events. Please book your party in advance to guarantee this fun ride for your event. With its left-aligned slide, left-sided tunnel and sleek design, this obstacle course challenge gives an action packed punch to any event, festival or party. Kids can choose from several different fun and engaging activities in this primary-colored red, blue and yellow inflatable play structure. The obstacle course challenge is perfect for kids of all ages. This inflatable obstacle course can be an amazing centerpiece for an Indoor event or any backyard party. The inflatable play structure begins with a front-loading obstacle entrance, taking participants through tunnels and pop-ups to facilitate maneuvering skills and build confidence. The challenge obstacle then leads to an exciting front-exiting climb and slide, all to guarantee hours of enjoyable physical activity. Each inflatable play structure has mesh windows for easy viewing, and is constructed of the fire-resistant, lite n' strong™ vinyl for easy portability, durability and safety. The Monster Obstacle Course is the latest in a line of inflatable play structures from Lotza Party, and is sure to benefit any childs or adults party. This oversized inflatable play structure has a bright and colorful theme of yellow, red and blue, perfect for high-traffic days. The Monster Obstacle Course is set up for friendly competition play, with dual entrances and exits. This impressive structure measures over 12'6" feet tall, and features mesh sides for easy viewing from beginning to end. Our mega combo interactive gives your guests plenty to do during your party. 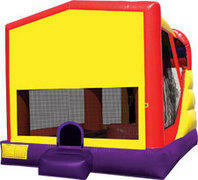 This unit offers a ladder, slide and basketball net inside plus a large bounce area. If you are looking for all in one entertainment than you found your ride. 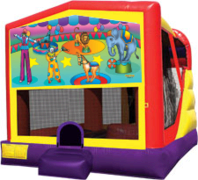 Kids and adults can use this interactive inflatable moon bounce combo unit. This unit features a great bounce area and basketball room as well as a giant slide to keep your youngsters playing all day long. This 4-feature challenge is jam-packed with fun, offering a generous area of jumping area, basketball hoop, climb and slide. Bright and lively this unit offers more fun per square foot than any other! Each of our attractions is approved for both indoor and outdoor use, meets ASTM standards and comes standard with Lotza Party's 15 oz. lite n' strong™ fire resistant viny. High-visibility mesh around all sides allows spectators to view easily. Our glitz girl combo interactive gives your guests plenty to do during your party. This unit offers a ladder, slide and basketball net inside plus a large bounce area. If you are looking for all in one entertainment than you found your ride. 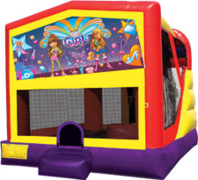 Your little girl will be a queen for the day with this inflatable combo unit. This unit has the best of bouncing and sliding all wrapped into one ride. Book this combo unit early to ensure your party date is available. 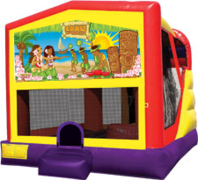 Our luau combo interactive gives your guests plenty to do during your party. This unit offers a ladder, slide and basketball net inside plus a large bounce area. If you are looking for all in one entertainment than you found your ride. Transport your party to the Caribbean with this inflatable combo unit. Add some beach balls to this interactive inflatable bouncer and your guests will be busy all day long. Congo line not incluced. Our circus combo interactive gives your guests plenty to do during your party. This unit offers a ladder, slide and basketball net inside plus a large bounce area. If you are looking for all in one entertainment than you found your ride. Step right up little ones because you are about to go on the ride of your life. Parents you can add some inflatable balls to this attractions for even more fun for the kids. Let's go to the Big Top! Our rock star combo interactive gives your guests plenty to do during your party. This unit offers a ladder, slide and basketball net inside plus a large bounce area. If you are looking for all in one entertainment than you found your ride. 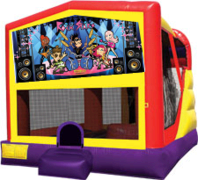 Party like a rock star in our inflatable combo interactive. Parents give your kids some inflatable guitars and your party will be rocking until the last set. This unit books fast so make sure you leave a deposit for your next party as soon as possible. Our robo car combo interactive gives your guests plenty to do during your party. This unit offers a ladder, slide and basketball net inside plus a large bounce area. If you are looking for all in one entertainment than you found your ride. This ride offers more than meets the eye. Transform your guests with this inflatable combo unit. Parents add some inflatable balls to this unit to really get the kids having fun. Our sports combo interactive gives your guests plenty to do during your party. This unit offers a ladder, slide and basketball net inside plus a large bounce area. If you are looking for all in one entertainment than you found your ride. 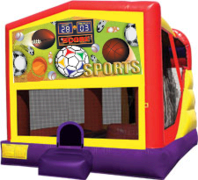 Whatever sport you play our inflatable combo unit will make your child's party the talk of the town. Add some inflatable sports balls into this ride for even more fun for your guests. Your kids will exercise all day long with our interactive sports unit. Our pirate combo interactive gives your guests plenty to do during your party. This unit offers a ladder, slide and basketball net inside plus a large bounce area. If you are looking for all in one entertainment than you found your ride. A pirates life for me. 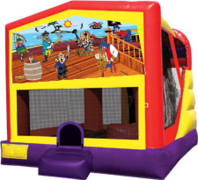 Your guests will get transported to their own private pirate world with our inflatable pirate combo interactive unit. This ride will keep your little buckaroos exercising all day long. Give the kids some inflatable pirate swords and eye patches and your party will be the talk of the town for years to come. Our ballerina combo interactive gives your guests plenty to do during your party. This unit offers a ladder, slide and basketball net inside plus a large bounce area. If you are looking for all in one entertainment than you found your ride. Transport your guests to ballerina land. Add some inflatable princess wands and your party will be the talk of the town. 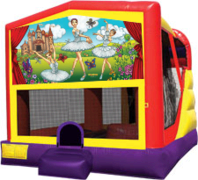 Our Lil Ballerina combo inflatable ride is very popular so make sure you leave a deposit or book your party in advance. Search us on the web: inflatable obstacle course, obstacle course rental, obstacle course rental New Jersey, obstacle course rental South Jersey, obstacle course rental Central Jersey, obstacle course rental North Jersey, obstacle course rental Delaware, obstacle course rental Maryland, obstacle course rental Pennsylvania, cheap obstacle course rental, discount obstacle course rental, coupons for obstacle course rental, best obstacle course rental, birthday party obstacle course rental, backyard obstacle course rental, party obstacle course rental, party inflatable rental, large obstacle course rental, blow up obstacle course, kids obstacle course rental, event obstacle course rental, inflatable obstacle course rental New Jersey, inflatable obstacle course rental South Jersey, inflatable obstacle course rental Central Jersey, inflatable obstacle course rental North Jersey, inflatable obstacle course rental Pennsylvania, inflatable obstacle course rental Delaware, inflatable obstacle course rental Maryland.